I am a bit late to the party with this review. Unfortunately, upon release, I was struck with a list of issues. It took three weeks before a patch arrived that allowed me to play the game. It is, however, only recently that I really sat down and played from start to finish. 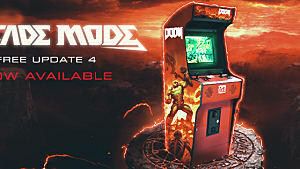 Release issues aside, let's take a look at the return of the FPS king DOOM. 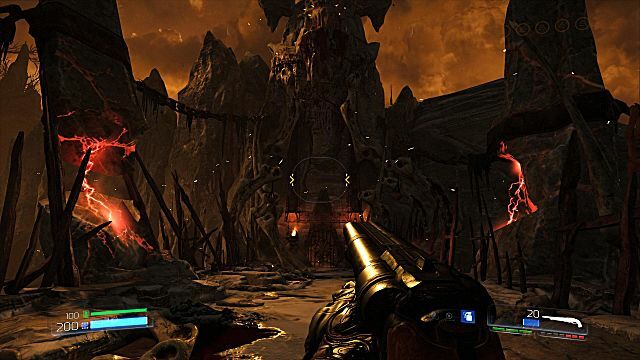 DOOM is an old-school FPS developed by Id Software and published by Bethesda Softworks. It released May 13th on PC, Xbox One and PS4. 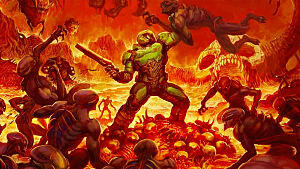 It is a reboot of the original 1993 title DOOM. The campaign is good old fashioned fast-paced action with the gameplay of the original adapted and modernized. Sadly the multiplayer and Snapmap do let the product down a bit as an entire package. You take on the role of the DOOM marine. Referred to in-game as the Doom Slayer and commonly known to the community as DoomGuy. Doom Slayer awakens to find himself chained to a stone slab with monsters approaching. Using all his strength he breaks the chains, kills one of the monsters and grabs a gun that lays on the floor. After dealing with the monsters, he leaves the room to find his suit of armor. Equipped and ready for action, he approaches a computer to the side of where his armor lay. 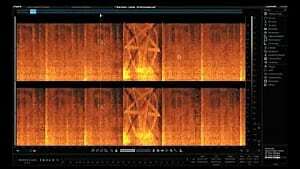 He is contacted by a Dr. Samuel Hayden. 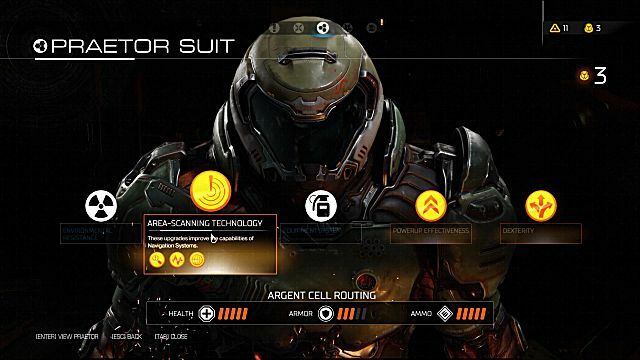 With pure aggression, Doom Slayer pushes the computer away and begins his rampage on the demon forces of hell. Begrudgingly with Hayden's help -- he must find a way to close the portal and put a stop to the invasion. 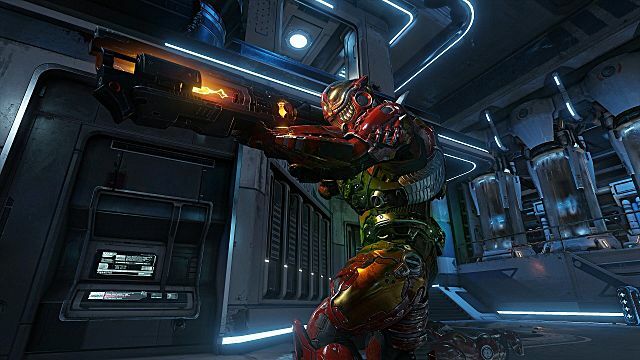 While DOOM is a reboot of the original game, its story is vastly different. Due to humanity having an energy crisis the UAC open a portal to hell to retrieve its energy source and use it as power. In the original game, a portal to hell was opened due to teleportation experiments going wrong. 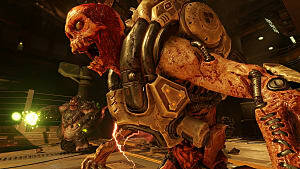 As for the Doom Slayer, in the original game, he was a marine on the Mars base while here he's a being feared by demons. His backstory is revealed throughout the game. While DOOM is a reboot, it's story is technically a sequel. 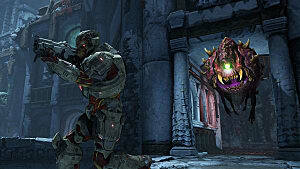 Various aspects of the game take the previous games stories into account including DOOM, DOOM 2 and DOOM 64. Most of the background story is told through the dossier by collecting various data logs throughout the game. Overall the storyline, Doom Slayer's background, UAC, hell, Hayden, and the antagonist Olivia Pierce are all interesting. The new direction of the storyline is also something I greatly appreciate as oppose to it being direct from the original. It is well paced and told. The entire story is slowly revealed while the action is kept fast and furious with little delay. There are segments with dialogue that halt the gameplay but they are few and far between. When it comes to the story -- it's really well implemented while not taking anything away from what DOOM is known for. That would be how you would describe DOOM's gameplay in a single sentence. 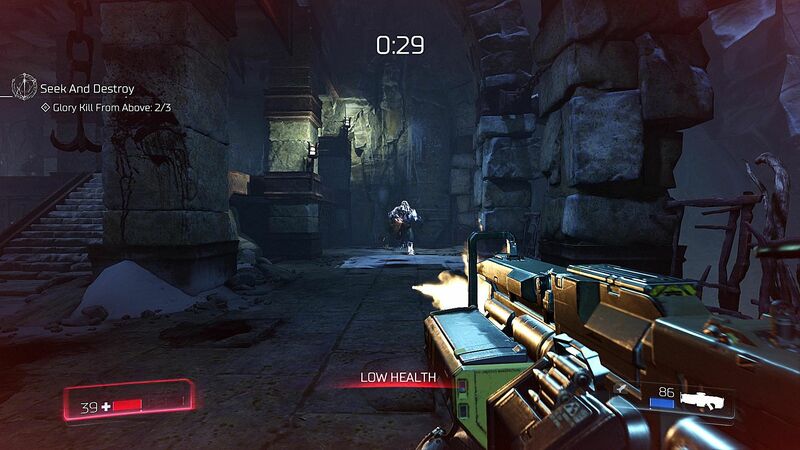 The gameplay takes the old-school approach to FPS combat. Big guns, no reload and lots of enemies to use them on. The new addition to the combat is the glory kill mechanic. I appreciate the tremendous amount of work that went into the mechanic. There is a different unique kill from every angle of every enemy. Each of the glory kills being extremely gruesome. From ripping zombies arms off and slapping them with it, to pulling a Cacodemon's eyeball out -- They truly are glorious. While the mechanic is cool and fun its impact is short-lived. You can perform a glory kill on every single enemy if you want. After executing about fifty glory kills in the first two levels, it becomes repetitive -- I wish they implemented it as an occasional reward as oppose to it always being available. The chainsaw also makes a return, with it having its own useful mechanic. Essentially it is the go to weapon when ammunition is low. Upon killing an enemy with it (instantly), they drop a large amount of various ammo. While in reality, this makes no sense, from a gameplay perspective it works well. 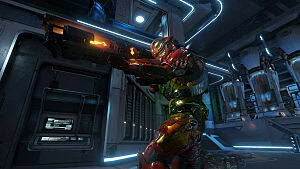 The gameplay is a great modern adaption of the original DOOM style. It is fast, adrenaline filled frantic action with tonnes of gore. 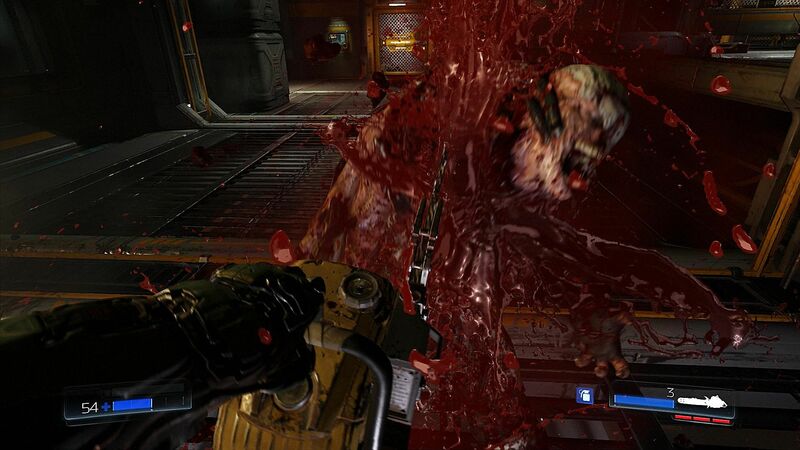 It is the DOOM experience that the fans of the original really wanted as oppose to the horror themed DOOM 3. 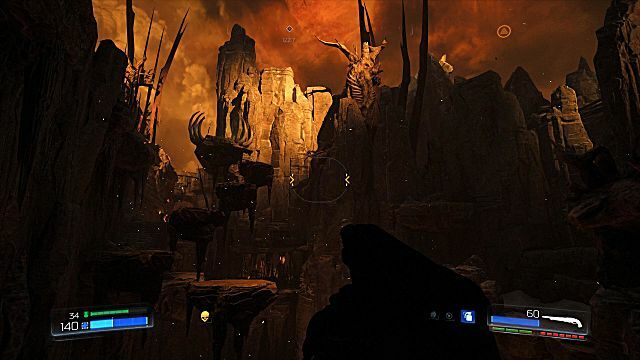 Id Software couldn't make a return to the old style of DOOM without adding in secret areas. Throughout the game, there are lots of them to find. Some are more useful than others. There are hidden areas that contain powerups like the Elite Guard armor chip and argent cells. While others may hold a few supplies. 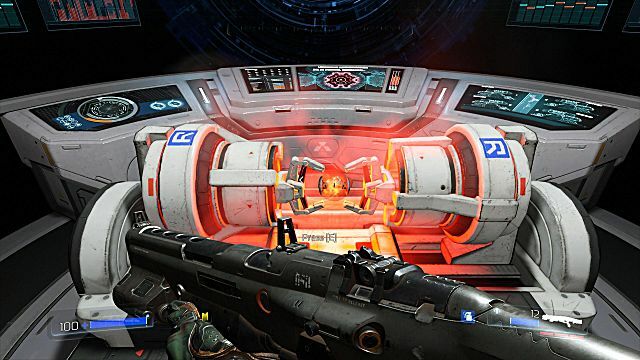 There are of course also collectables such as varying Doom Slayer figurines to collect and hidden retro levels to unlock from the original two games. I feel that a few secrets were put in for the sake of it more than a general purpose -- Never the less they are all fun to seek out. The armor chips belonging to Elite guards are used to upgrade your armor. Upgrades include protection from explosive damage, map reading, upgrading power-ups and more. The more upgrades you place into a category the more chips are required for the next upgrade. Next up are the weapon upgrades. As you progress throughout the game you will find small robots with boxes attached to them. These boxes contain weapon mods. 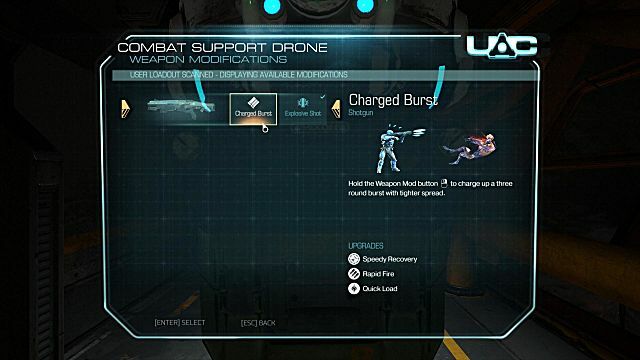 Nearly all the weapons each contain two different weapon mods. Each mod then has a number of upgrades. Just like with the armor upgrades, the cost of an upgrade increases with each addition. You gain weapon upgrades for completing challenges, finding secrets and killing enemies in each level. 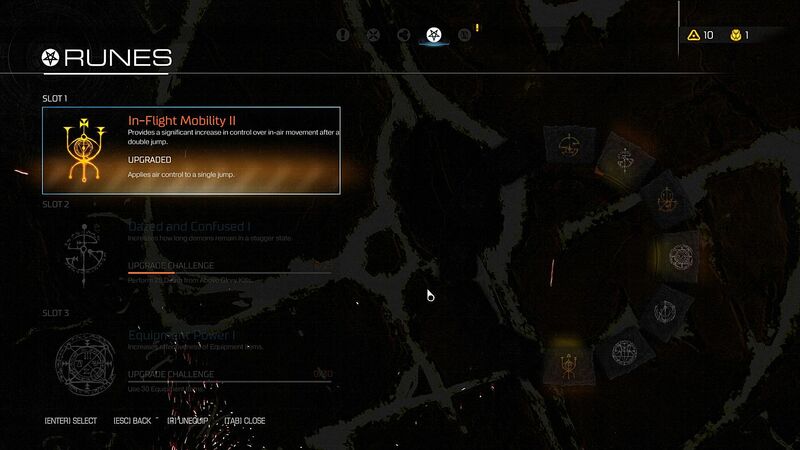 The final upgrade of a weapon mod requires a specific challenge to be completed to unlock it. Then you have the rune trials. These are challenges found throughout specific levels that upon completion, will reward you with a rune. The runes can then be equipped to grant the player special bonuses. They may also be upgraded by completing specific challenges, each rune having its own. You can equip up to three runes in total. Finally is the argent cell upgrades. 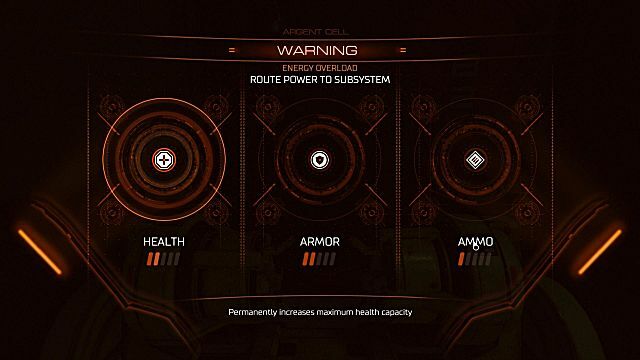 Upon finding an argent cell, you may upgrade your total health, armor or ammo total. Each category may be upgraded a total of five times. The upgrade and power up systems are all fun. Most of the upgrades are well hidden and require a bit of exploration and determination to find. Despite that, there may be a few too many upgrades for this form of a game. I often found myself forgetting about them while becoming absorbed with the combat. This is particularly the case with the runes. I only had two equipped throughout the entire game and forgot about them for the rest of it. 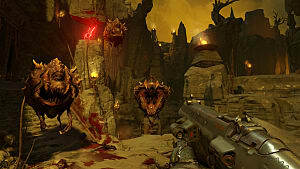 Never the less, they are a nice addition to the game that brings more depth than what would be expected of DOOM's name. All the enemies in the game are entirely redesigned from their models in previous games. 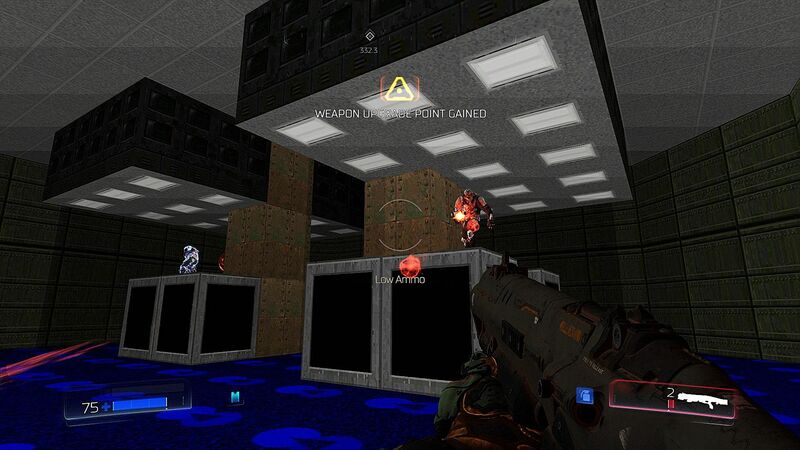 Unlike in DOOM 64 and DOOM 3 however, they are more reminiscent of those from DOOM and DOOM 2. This is most noticeable with the Cacodemon, Mancubus, Lost Soul and the Pinky demon. All the enemy redesigns are fantastic and they look exactly as you would envision them with modern graphics. They all act in their own unique ways too. The imp, for example, is fast moving and capable of jumping great heights. The Mancubus, on the other hand, is a slow wall of flesh with powerful weapons. A few new enemies such as the Summoner was also introduced. Most of the weapons have also been redesigned. The only exception is the Super Shotgun, with its classic double barrel shotgun look. How could you perfect the look of the Super Shotgun any further anyway? Some of the weapons have changed both in type and function. The pistol is now a self-recharging laser weapon and the pump-action shotgun is now a combat shotgun, as an example. There is also the introduction of the Gauss Rifle, a new addition to the series and the assault rifle that was only present in DOOM 3. As for the BFG 9000, it has never looked or functioned with such a badass manner. All the weapons designs look great and they are all amazing satisfactory to use. The level design of DOOM is generally good. The levels vary enough that they never become boring. 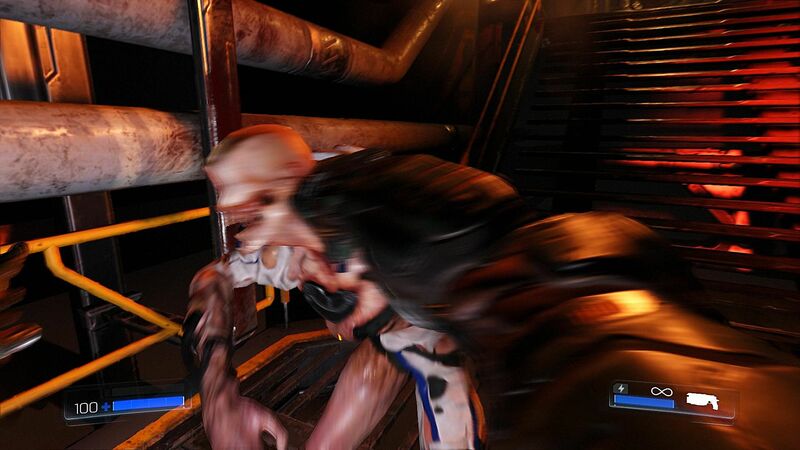 A nice change from the repetitive and dull environment found in DOOM 3. They are easy to follow, never resulting in confusion or getting lost. The hell levels look amazing too. They are pretty much what you would expect hell to be. If I was to complain about anything in relation to the level design it would be that certain levels cut you off from the first half. If you missed any secrets prior to falling down a hole you can't return through, you need to restart the whole level to get them. A mistake on a game that encourages exploration. The only other complaint I would have it the Argent Tower level. Here you must find a way of climbing to the top of the tower. I find it awkward in places and it just slows down the pace of the game. Other than that I would have no issues with the level design. As for the atmosphere, it's brilliant. During the quiet moments in between the adrenaline-filled action and soundtrack, there is an eerie ambiance with sound effects to be found. It really gives a feeling of being alone on a doomed demon infested base far away from home. The multiplayer to DOOM has always been something of negativity. It wasn't until I experienced it for myself that I found out why. First off, there is no balancing between players. For example, you could be going up against a group of other players that are levels 40+ while you could only be about 10 if not lower. This gives them a big advantage. Firstly, they will know the maps like the back of their hands. Secondly, they will have unlocked hacks and weapons that you would have no access to. Generally more powerful weapons at that. The second issue is that all the modes except deathmatch (recently added) and team deathmatch are also dead. It could take anything from up to five minutes if not longer to get a match started. I also feel that the multiplayer has too much of a modern FPS approach to it than the name DOOM would bring to mind. It takes the very much generic class system into play as oppose to just having a blank slate and letting it rip. At the end of each match, you gain experience depending on your performance. You also unlock new hacks, armor pieces, and weapons as you level up. While the multiplayer can be fun, it is definitely not what is expected of DOOM multiplayer. I find it to be just so, generic and very much like your typical COD sessions in a sense. Then we have the feature of Snapmap. Essentially a level editor that allows you to publish and share your level through the Snapmap system. The level editor is basic enough and easy to use, allowing anyone to create their own levels. If anything I feel it may be a bit too basic to a degree and not give quite enough freedom. You wouldn't gain the freedom like Legend of Grimrock's editor would. 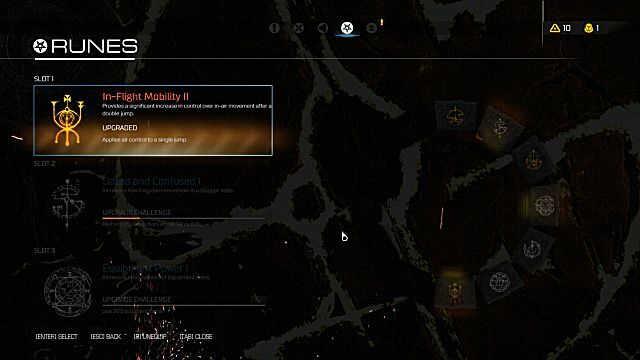 You can also play any maps that have been published by the community. As a whole, Snapmap is alright. It is nothing fantastic nor is many of the dozen or so levels I have played on it. 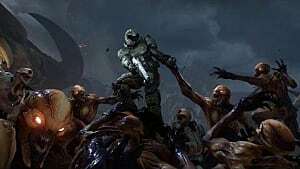 Overall the multiplayer and Snapmap have their own fun to be had but bring down DOOM as a package. 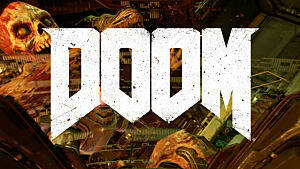 Overall as a whole package DOOM is pretty good. The campaign is excellent with a good plot, fun and deep gameplay and generally good level design and atmosphere. The multiplayer is fun but only if you are looking for a deathmatch or team deathmatch. The Snapmap is easy to use and does offer some fun but doesn't give anything thrilling. I would give the campaign a 9, multiplayer 7 and Snapmap 6 rounding off the overall score of the package at 7 out of 10. It is a great game for so many reasons but it is the single player campaign that saves it from being an average game.